These are often the people that make me swoon for when the two come together in that amazing way I often find myself so lost in their visual story telling that I forget to pay attention to the plot – which may or may not be a good thing depending on the film! But recently I saw Atonement and – even through grim scenes – was just mesmerized by how visually stunning it was (and the use of green. If you’ve been reading this blog you know I’m a smitten kitten for that colour). There are two interesting articles on the film’s design. 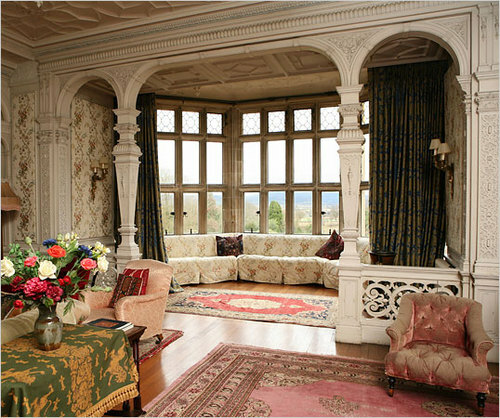 The first is the story of the actual Tallis Home, Stokesay Court; how a woman inherited it and was drowning in its debt until Joe Wright wanted to use it for this film. The second comes from Focus Features site on how they created all the scenes based on historical photos and evidence.